Batting this light bulb is the only thing that cheers me up. 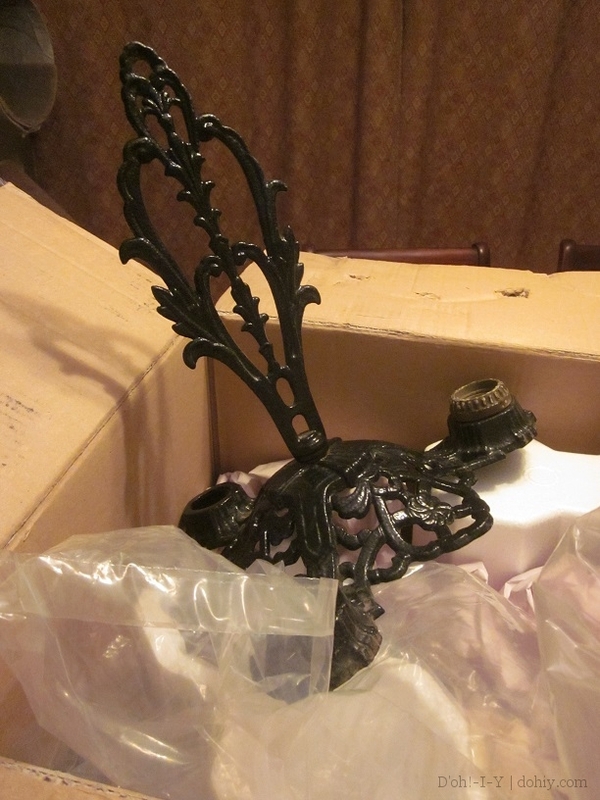 As part of our bedroom redo, I wanted to restore and install an antique light fixture. I bought one in rough shape online. You’ve seen this puppy before. 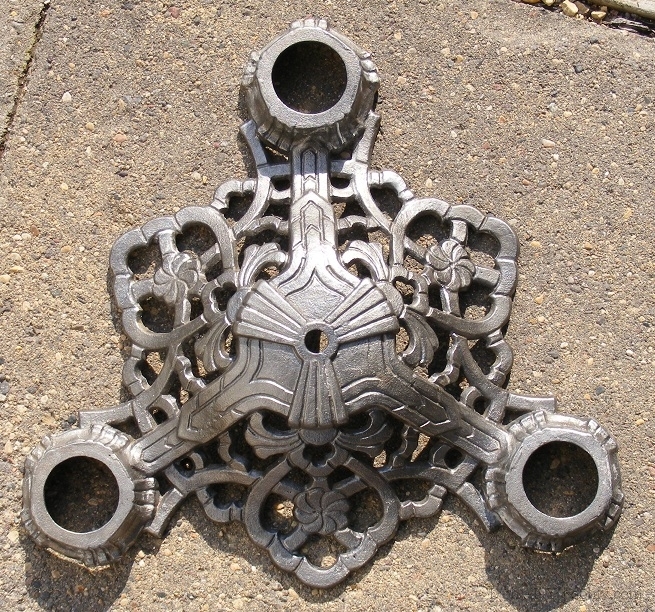 I spent many hours freeing the fixture from its painted carapace, finally arriving at bare metal. The “polychrome” refers to the small touches of color. Usually, these are green on the leafy elements and red on any flowers or crests. To get from bare metal to this look, the next step was to prime it before any rust could set in. 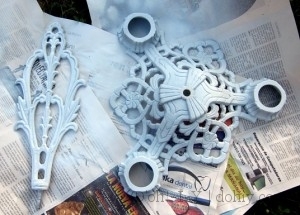 I used a Rustoleum spray primer for metal. I was almost sad to cover up the metal after working so hard to reach it, but rust would have been far more saddening. 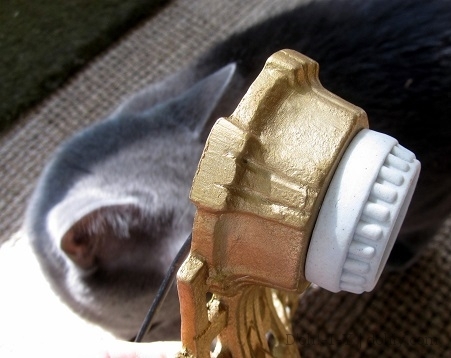 Once the primer was set, I hit it with a couple of coats of gold spray paint. Mr. T just called: he wants his pendants back. I used the Rustoleum that gives a “bright reflective finish” and it surely delivered. But this was just a base coat to give some dimension. I applied Rub ‘n Buff metallic wax (in Grecian Gold) over this layer to warm it up. With the main body color in place, it was time for the polychrome. I took the advice of The Artist Generally Known (to me) As Mom: she recommended acrylic paint and a coat of fixative. And, BONUS, her traveling kit of paints was within striking range at my brother’s house. My goal for the polychrome was not Technicolor, but more of a wash. I wanted it to look like the original colors had been bright originally, but they had faded with age. I watered down the color and applied tentatively; it’s easier to add than to take away. I didn’t use much, and some wore off a bit when I applied the fixative (hello, pardon??). I used green for the leafy parts, but I used a blue for the floral elements instead of the more usual red. In the before picture, you can see one of the original sockets still attached. 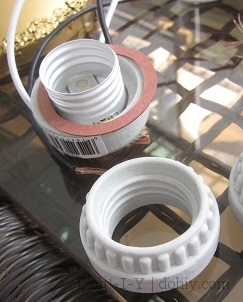 This fixture takes a ring-type porcelain socket, which is basically a porcelain socket with two parts that screw together. I bought ones with the leads already attached. Please allow Inigo to demonstrate. 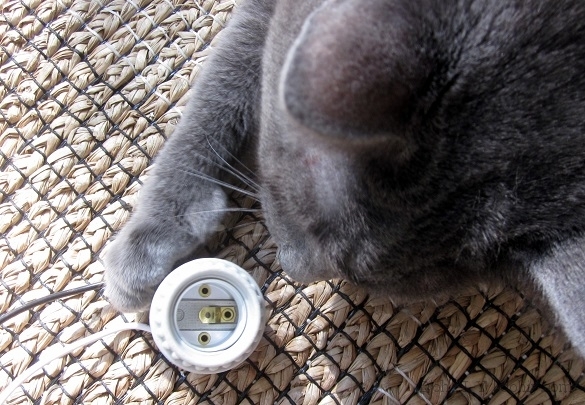 The ring screws onto the socket, which is inserted from the top. I later Rub-n-Buffed the porcelain ring to match the rest of the fixture. Have an electrician or lamp repair technician wire it up for you. They could wire it for your installation, or the electrician could wire and then install it. It should cost relatively little, and you’ll have complete piece of mind. If you want to wire or install it yourself, check out code requirements and seek out competent instruction. BobVila.com and ThisOldHouse.com (no longer affiliated, those two!) both offer relevant guidance. To assemble the pieces, the “pan” part faces down. I bought a finial to replace the hex nut that had been holding the thing together (in the wrong orientation) when I received it. The new finial screws onto the big matching “finial” (I really want the formal name for this part if anyone has it — there seems to be some diversity of terminology out there) that stiffens up the fixture so it hangs straight. 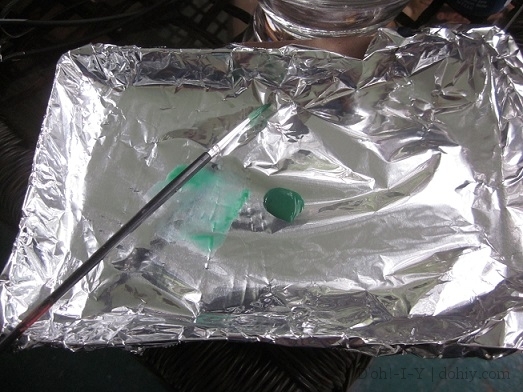 This piece attaches to the chain. Finial bone’s connected to the chain bone, chain bone’s connected to the canopy bone (more about the canopy here), canopy’s attached to the HOUSE. That was a long one — thanks for reading to the end. I hope you found it illuminating! BWAHAHA! I crack myself up. Linking up at House of Hepworths and Thrifty Decor Chick — thanks for hosting! 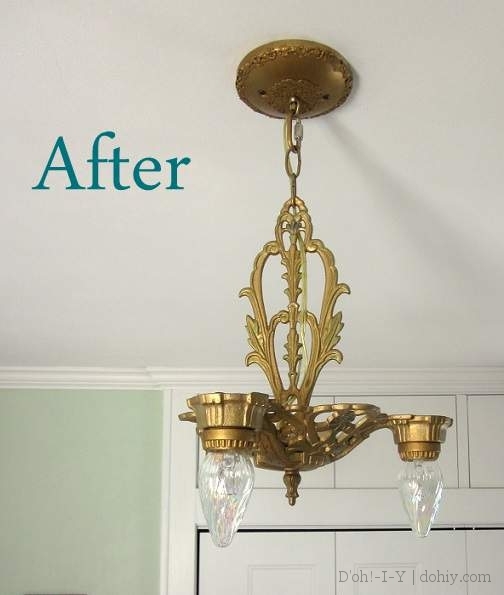 This entry was posted in Before & After, Decor, Electrical, Repair & Maintenance, Salvage and tagged 1920s ceiling light, restoring light fixture. Bookmark the permalink. 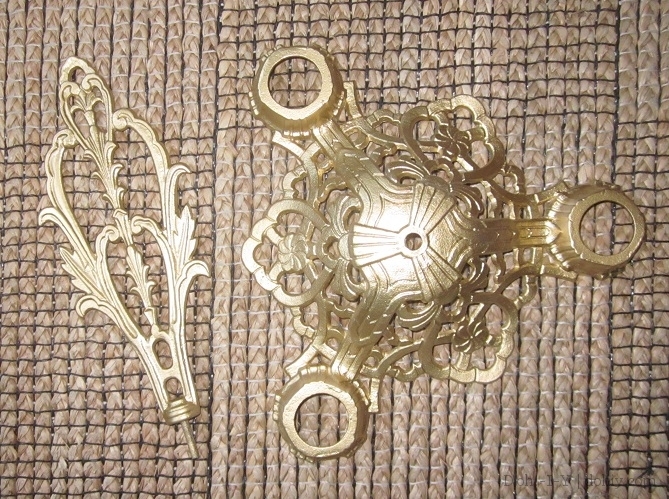 I was given two deco light fixtures by my Aunt, about 25 years ago. I put them in storage because I have been building. Now I am ready for the fixtures and they need to be rewired, which is no problem. However, they seem to be painted like a copper color. While I will probably never sell them, I don’t want to decrease their value. Should I repaint them, or leave the original paint alone? Hi, Richard — that’s a great gift! The paint may well be original, and it would be worth finding out. My lights are always in rough shape by the time I mess with them, so I’ve never had that issue! Do they have any manufacturing marks on them anywhere? I’m thinking if you could find anything stamped or cast into them, you could send that info with pictures to an expert and they could give you the lowdown. 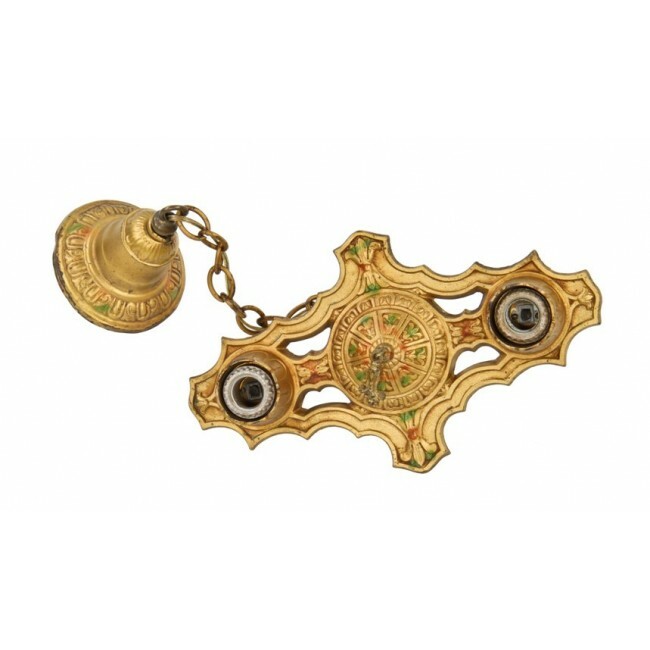 If no marks, Vintage Lights has images from old catalogues at http://www.vintagelights.com/catalogue.html but I’ve never had a lot of luck finding my fixtures. For experts, John Remackel at John’s Antiques is great, but he’s in the process of retiring. No website, but his number is (651) 222-6131. Other options are Allen’s Antique Lights (http://www.antiquelight.com/) or contact Urban Remains in Chicago (http://www.urbanremainschicago.com/products/lighting.html). Someone at one of those places should be able to give you some info or tell you who would know. Please stop back and let us know what you find out — I’m obsessed with old lights, and I’d love to hear what you learn. Thanks for coming by! Great job! 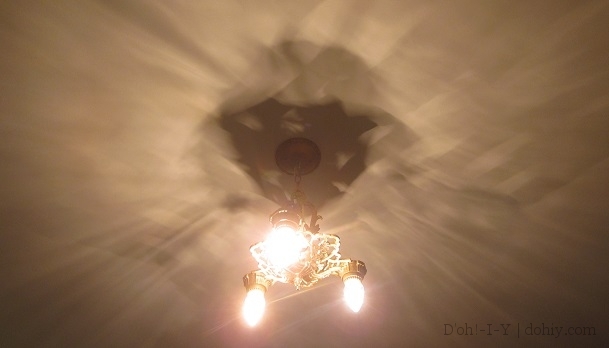 I can totally relate to your passion for vintage light fixtures! Two queries: Any issues with paint adhering, despite using the Rub & Buff wax underneath? Secondly, what did you use as a fixative, and what type of sheen did it have, if any? My project is just a small, metal flush mount fixture that is in my entryway and most likely from late 20’s/early 30’s. 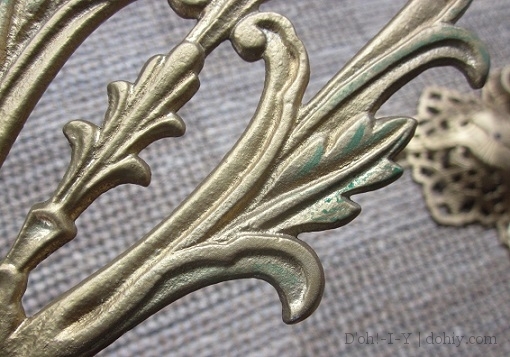 It’s a bit rusty (not sure of the metal), but has a raised floral design, which I can (faintly) see was once painted. Your project inspired me, and I can’t wait to get started! Thanks for the information! Hi, Stacy — it’s me, Stacey! 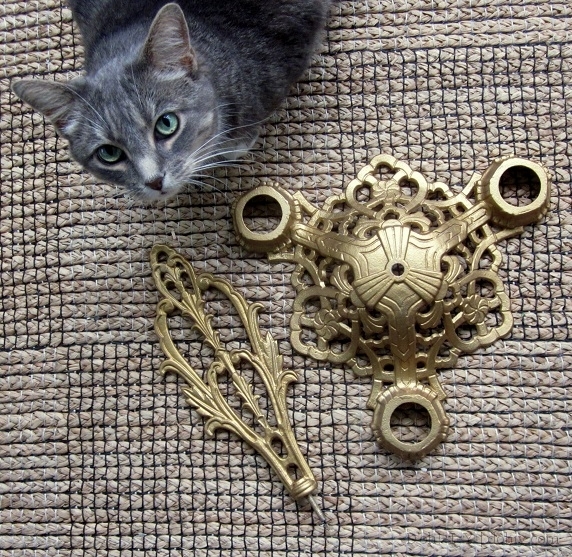 It’s nice to hear from someone who loves these old fixtures, and thanks for the kind words. It’s a little bit of a niche interest! I haven’t had any issues with paint adhering to the Rub & Buff, as long as the Rub and Buff is completely dried and has been fully buffed down to the desired sheen. Since fixtures do not get handled very often, I have to admit I don’t always use a fixative. I have used a clear wax on a few, which was a nice mellow effect. How is your project going? Come back and tell me all about it. I love old lights!